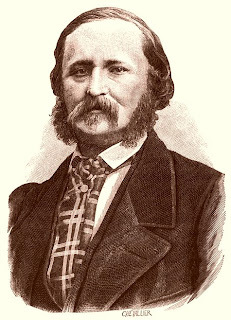 Édouard-Léon Scott de Martinville was born 25 April 1817 - died 26 April 1879 at the age of 62 years) was a printer and bookseller of France. He found the first tape recorder in the world, namely phonautogram, who in his patent on March 25, 1857, the patent code # 17.897 / 31.470. Since 1854 he is interested in mechanical writing voice. When writing checks on some carvings physical textbooks he found some pictures of the anatomy of hearing. He was looking for a tool that can mimic the workings of hearing, using elastic membrane as the eardrum, some levers as ear bones, which will move the pen that will write the sound on the surface of paper, wood or glass are given soot. On January 26, 1857 he sent his design in an envelope to the French Academy. On March 25, 1857, he received a French patent code # 17.897 / 31.470 for phonautogram. Phonautogram used to capture the sound of a trumpet, that touches and moves the diaphragm stiff brush to write on paper blackened with soot, in a cylinder is rotated by hand. Scott made some phonautogram along with an acoustic instrument maker named Rudolph Koenig. Unlike Edison phonograph made in 1877, could only write phonautogram voice and play the recording. This tool is only used for scientific research on sound waves. Scott de Martinville was able to sell some phonautogram for scientific laboratories for research on noise. This tool is useful in the study of vowel sounds and are used by Franciscus Donders, Heinrich Schneebeli and Rene Marage. But he did not make money from the invention and spent his life working as a bookseller at 9 Rue Vivienne in Paris. In 2008, the New York Times reported the discovery of several phonautogram from 9 April 1860. The announcement of the discovery accompanied by the announcement that the visual recording can be played "transform graffiti on a ballot paper by scientists at the Lawrence Berkeley National Laboratory in Berkeley, California." Phonautogram is one picture of Leon Scott is forgotten; paper is read and processed by a sophisticated computer program created by the Library of Congress. The voice is the voice of a ten-second song, originally thought to be the daughter of the inventor, known before the tape is played too fast and was his own voice, singing the song "Au Clair de la Lune". Phonautogram recording is considered a human voice and music recording world's oldest, predating recorded music Handel "Israel in Egypt" on an Edison phonograph, which was made in 1888. Scott de Martinville Phonautogram containing artificial Aminta playwright Torquato Tasso also been found. Recorded around 1860, possibly after rekamam Au Clair de la Lune, phonautogram is the oldest recorded human voice are discussed. Records older than the year 1857 also provides voice Scott, but was not recognized as an irregular noise.